Having turn-by-turn directions on my phone has admittedly spoiled me. I turn on GPS navigation when I'm on my way home from the supermarket or driving to my friend’s house. It’s not because I don’t know the route, it’s because Apple and Google Maps both route me around traffic jams I wouldn’t otherwise know existed. Plus, turn-by-turn navigation just feels futuristic and cool. Of course, there is a minor problem with GPS directions on your phone: If you’re not paying attention to when your phone tells you to turn, you’ll get lost in that awkward “make a U-turn” limbo. And, you can’t just pick up your phone to look at the map directly – not only is it dangerous, but it’s also illegal in many states. Fortunately, though, old-school GPS manufacturer Garmin has come up with a fascinating piece of technology for your car: An aftermarket head-up display, or HUD. If you’re not familiar with HUD technology, you will be. Many new cars already come with the technology, which projects your driving speed directly on the windshield, giving you all the information you need to drive safely without having to look away from the road. 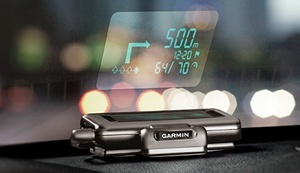 The Garmin HUD goes a step further, connecting to your smartphone via Bluetooth to project not only your speed, but upcoming driving directions and your estimated time of arrival. Basically, the head-up display puts all your need-to-know information in the safest place possible. To use the Garmin HUD, you’ll need to embrace one of the company’s extraordinarily expensive mobile navigation apps, the 2.5-star rated Garmin StreetPilot ($49.99) or the 3-star rated NAVIGON ($59.99). Neither Google Maps nor Apple Maps will work with the device – a major failing, given how ubiquitous (and free!) the two apps are. The Garmin HUD will be available in an estimated 5 to 8 weeks, pending approval from the Federal Communications Commission. The device will retail for $129.99.